Beautiful Battles! Bewildering Babes! Developer and publisher SNK brings its latest spectacle-fighting experience to the Nintendo Switch! 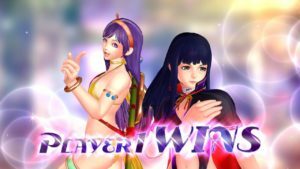 In this review, we check out if SNK HEROINES Tag Team Frenzy can muscle out the competition! 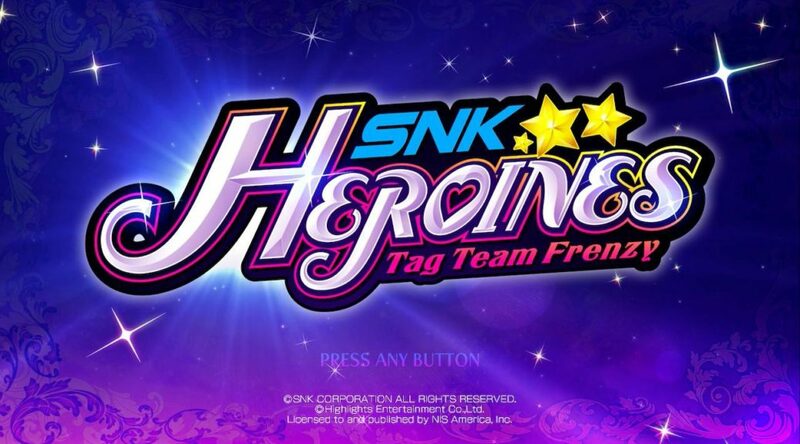 SNK Heroines is a spin-off from SNK’s fighting franchises – bringing together some of the company’s most popular or recent ladies together. Mainstays such as Mai are joined by fresher faces like Zarina – forming a roster of 14 pretty-faced fighters. Like most fighting games, players duke it out to be the last (wo)man standing with health points remaining. The typical “special” meter is also present – so finishing moves and special attacks need to be managed carefully. 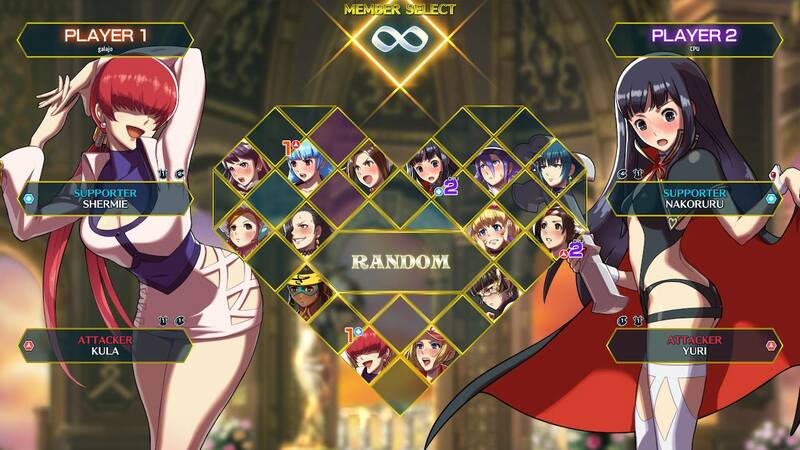 However, SNK Heroines features simpler controls compared to other fighting games – with one button each for weak attacks, strong attacks, special attacks, and grabs. The R trigger also activates finishing moves, while the L trigger blocks. Fighting game veterans will not find their usual high, neutral, and low attack layout here. This basic control scheme is quite accessible for novices, as advanced inputs like quarter-circles are not required. In fact, you only need to press directional buttons with special attacks to perform flashier moves (e.g. Left + A). Meanwhile, more complex tactics arise from chaining attacks together – so fighting game veterans still have an advantage. Weaker players will need to master air combos in order to actually beat the highest-level CPUs. As implied by the ‘Tag Team Frenzy’ title, players can also swap between two characters during combat (with the ZR trigger). Both characters share one health gauge – so tagging only helps to recharge the benched character’s ‘special’ meter. It’s a subtle way of encouraging offensive play, which promotes more frantic matches. The tag team mechanic also allows for up to four players to brawl together in 2-vs-2 matches, or for two friends to team up against CPUs. With the option to use a single joycon per player, it’s actually easy to set up a quick session with your friends anywhere – especially with the Switch’s portability. 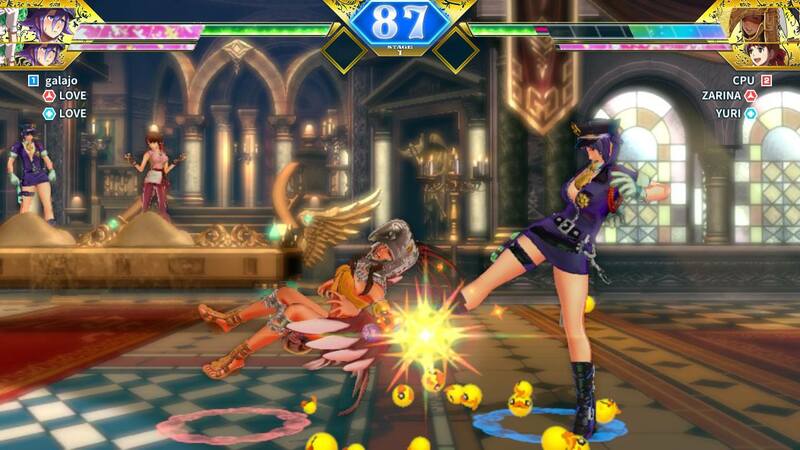 Overall, SNK Heroines is a passable fighting game – where fights are designed to be flashy spectacles regardless of your skill level. There’s no denying that the meat of this game’s development went elsewhere. Oh, that meat definitely went elsewhere, for sure. 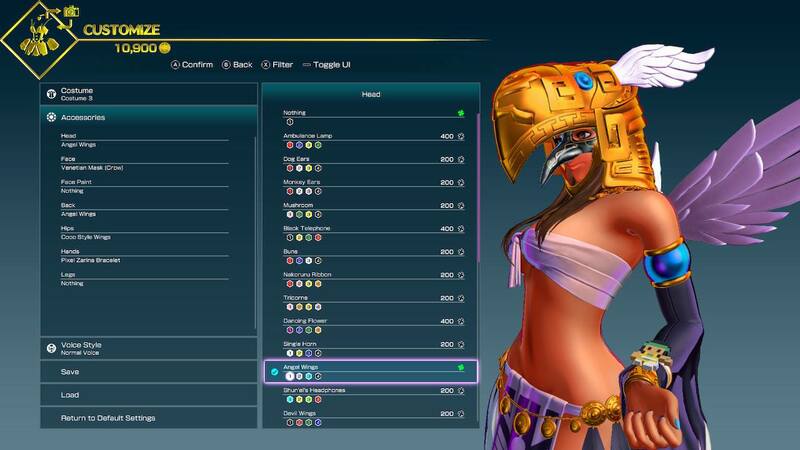 As you browse through the game’s fighter-select screen for the first time, you’ll encounter quite an eyeful. Most of the fighters start off with hilariously revealing costumes, and you can tell that SNK was shooting for that eye-candy. While some characters like Shermie are dressed stylishly, others ladies like Leona get saddled with cat ears and swimsuits. Performing finishers with Mai or Luong will give you some pretty…flattering angles. Even the hunky Terry Bogard gets turned into a shapely woman in short shorts – just because the developers could get away with it. You get the idea. 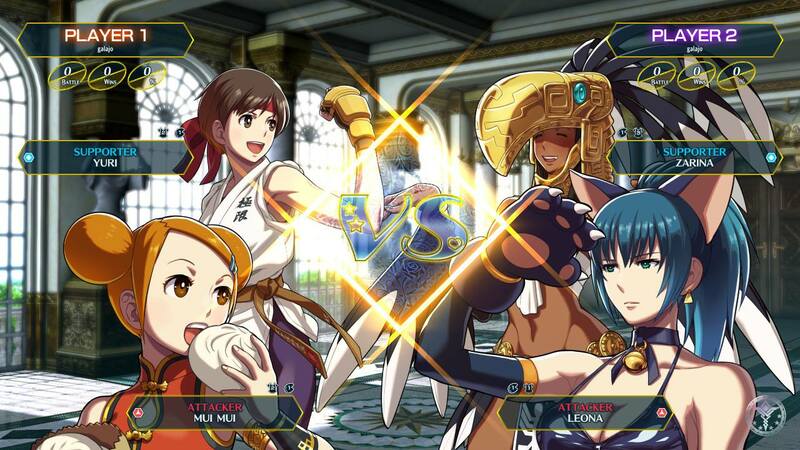 For what it’s worth, the ridiculous presentation of these fighters gives SNK Heroines a fun and unique visual identity. Just don’t expect to get looks of approval from friends and family (unless they also have a thing for cosplaying beauties). Each character also comes with a total of three costumes – two of which need to be unlocked. Purists will be happy to know that (almost) everyone can don their normal attire from the King of Fighters games. Additionally, players can also customize fighters with accessories like sunglasses or fox tails. Do note that these accessories are locked to certain body regions only – so you can’t really go too crazy with your creativity. Thankfully, you can ONLY purchase these customization options with in-game coins that you earn from regular matches. The developers could have chosen to shove micro-transactions into SNK Heroines, but graciously avoided such greedy methods. You’ll be able to earn a sense of pride and accomplishment on your own terms. 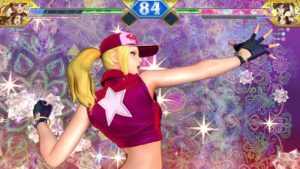 Overall, SNK Heroines overflows with appeal – and it offers a decent amount of content to pursue. If you love games that are absolutely unashamed about plugging fanservice into your eyeballs, you’ll feel right at home with this ridiculous game. As expected, SNK Heroines includes a barebones story mode – which is just a disguised means to train new players. You choose two characters to fight everyone else, until you give the final boss a beating. It’s transparent and nothing special. There is a silver lining, however. The selected two characters will interact with fully-voiced and unique conversations at the start of story mode – which gives some personality to the duos you’re playing with. The best conversations definitely happen when anyone pairs up with female Terry Bogard – as most of them sneer or gawk at Terry’s loss of manhood. Completing story mode with certain pairings also unlocks fun artwork – which creates more incentive to try out different teams. In short, the story mode is nothing to write home about – but experimenting with different combinations of characters can be a fun distraction. Story mode is also a convenient way to earn in-game coins (you get a few thousand each time), so it’s not really a waste of time. If you’re out for a quick commute or have some downtime at the office, story mode can tide you over. Sadly, I do have some important criticisms for SNK Heroines. First off – perhaps the fighting mechanics feel TOO simplified. For example, you can’t crouch during combat, so there’s no such thing as crouch-blocking or low kicks. This was a huge deal even for a non-veteran like me, because it shaves away a crucial layer of strategy (i.e. hit-stunning opponents with low attacks). The lack of options to surprise your opponent can feel suffocating after some time. Winning matches is also a little strange in SNK Heroines. You have to lower your opponents’ health gauge until it turns red, then perform a finishing move (with the R trigger) to defeat them. This is forced upon players, and there’s no way to KO your opponents with normal or special attacks – which somewhat limits the potential strategies that can be developed. The performance of SNK Heroines on the Switch can be questionable, as well. While the game looks polished whether in docked or undocked mode, matches typically ran at an uncapped frame-rate between 30 to 60 fps. Most fighting games aim for 60 fps minimum – and anything less optimum can throw off precise combos. Fighting veterans will have a hard time appreciating these flaws. Casual players can still enjoy the game perfectly fine. However, these small bugbears may betray SNK Heroines’ standing as a premium fighting experience for some folks. I actually applaud SNK for taking risks and experimenting with SNK HEROINES Tag Team Frenzy. The game is extremely accessible for players of all skill levels, and can make for a fun party night (if you have open-minded friends). Its visual style is charming and unashamed of how ridiculous it is – which will make it stand out on any collector’s shelf. However, fighting game veterans will be let down by SNK Heroines’ shallow depth. SNK may have gone overboard with cutting out complex moves and strategies – and it shows. Anyone with any experience of the fighting genre will notice the game’s limitations very quickly. Online lobbies for internet play were not populated at the time of this review – so it remains to be seen if any competitive communities can grow around this game. 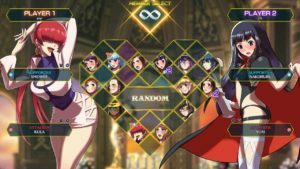 Overall, SNK HEROINES Tag Team Frenzy is difficult to recommend at its full price point of $49.99 – especially considering the added cost of post-launch DLC characters later on. If you adore SNK’s girls or can find the game on sale, you’ll probably love the gratuitous fanservice on offer. Below all that fluff, however…there’s not much that will satisfy a craving for intense fisticuffs. Super accessible for novice players. Good variety of content to unlock. Simplified mechanics can feel too shallow for fighter game enthusiasts. Inconsistent frame-rate on the Switch can hurt precision combos. Roster of characters is relatively small. Soup Verdict: This soup is photo-worthy, but it may not tickle your taste-buds for long. 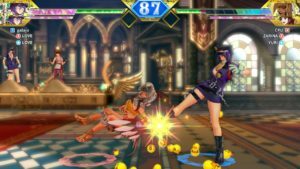 A review code for SNK HEROINES Tag Team Frenzy was provided by NIS America for the purpose of this review.